2018 was a quiet year on the nest. Dad made a final exit from the area and no eggs were laid. A few males pursued Em, who stayed near the nest and defended the territory. The late Spring and Summer at the Hornby Eagle nest were full of roller-coaster moments. On April 4, it appeared that Em lost ("miscarried") an egg. We saw her make a "poopshot" that contained a large white mass; she was on the CU cam at the time so the camera caught this reasonably clearly. Much to our surprise, this was not the end of the season: Em laid an egg late on April 20 and the eagles began the ritual of incubating for a few hours and then exchanging places. Based on Em's behaviour on the nest, we believe she laid a second egg late on April 23, 72 hours after the first one. On May 28, one of the eggs hatched. This would be Day 38 for the first egg and Day 35 for the second egg. We were overjoyed to see all the signs of the eagles reacting to a hatching egg and later Em fed a couple of bites of food to the new eaglet. We could not see the chick, except for some movements in the deep nest bowl. The next day (May 29), we were dismayed to realize that the eaglet had not survived the night. There was no feeding, and both eagles were found on the baby-sitting tree. 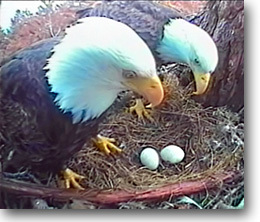 They did not appear to be incubating a second egg. The details of what happened remain a mystery. Dad and Em stayed in the area through June and July, occasionally visiting the nest and even bringing a stick or two. Mostly we would see them on the baby-sitting tree or hear their distinctive voices nearby. The last time an adult eagle was spotted (we are not sure which one) was August 5. Traditionally, Dad returns the last week of September. What will happen this year? Find the latest eagle news and see the latest photos by boonibarb in the Observations 2017-2018 section of our Forum. Our new camera is up and running! As most of our followers know, the bandwidth on Hornby Island is very poor, so we are not able to broadcast in high definition (HD). Our technical partner, Securco, recommended a Hikvision camera with a 30X optical zoom (a bit less than we had with the old camera, but those models have been discontinued). 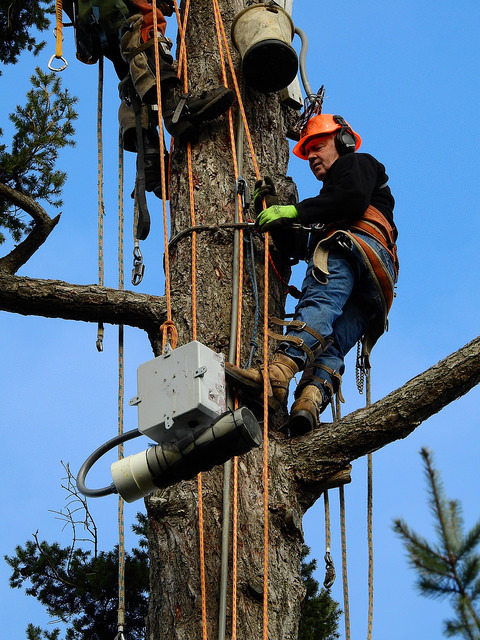 On February 27, the new camera and microphone were installed in the tree by Dan Hamilton of Whiskey Jack Tree Services and the new system was connected by a team from Securco. All photographs were taken by boonibarb. 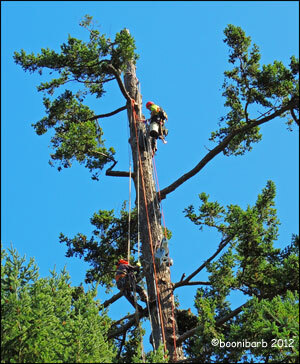 Dan climbs Gregg's Tree, where the cam is installed. Dale holds the camera box and microphone as he perches high in the tree. Dan and Dale install the camera and microphone. Find the latest eagle news and see the latest photos by boonibarb in the Ground Observations 2016-2017 section of our Forum. First, a heartfelt Thank You to several generous donors who responded to our fundraising campaign. We did raise enough to allow us to continue broadcasting the cam for the 2016-2017 season. However, on August 2, 2016, a powerful thunder and lightning storm moved through the area, resulting in several lightning strikes in the vicinity of Grassy Point. At 4:24 A.M., the cam went dark. It came back by itself 20 minutes later, but we no longer had sound from the microphone or the ability to move the camera via the PTZ controls. 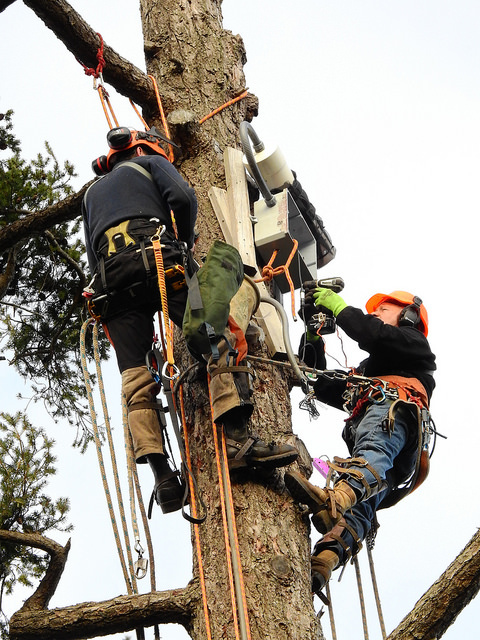 In late August, the cam was removed from the tree and sent for technical evaluation to Securco, the company that designed and installed the system. Securco was unable to get the camera working again, the DVR is only semi-responsive and they were also unsuccessful with the microphone. They are bringing in another DVR to see if the microphone, at least, can be "brought back." We are exploring options to replace the system - it is apparently now possible to get a high definition camera that is analog rather than digital (Hornby Island's internet will not support digital). Hopefully, a new system will be within our budget. Things were quiet during the spring and summer. Em, the female that attached herself to Dad last year, returned and stuck to him like glue again, helping to defend the territory. A good herring spawn in March brought other eagles to the area, but there were no huge battles like the ones we saw last year. At first, Dad did not seem all that interested in Em as a mate, but later on they mated and even did a bit of nestoration. There were no eggs and both eagles eventually withdrew from the nest area. Of course, we don't know what happened in August, but presumably Dad left to go look for salmon and Em did too. If you have loved watching the Hornby Eagles, learning about nature, making new friends with a shared love of wildlife, and sharing the highs and lows of an eagle pair's lives, please help us to continue bringing the cam to you. A donation of any amount is greatly appreciated. Please visit our Support page for information on making a donation by cheque or use the PayPal button on this page. Spring and summer came and went, but we have not seen Mom Hornby since mid-March. Dad stayed on or near the nest tree, holding his territory. A female we called "Em" (for the appearance of her white neck feathers, which seem to shape the letter M) stayed close by Dad's side, clearly helping to defend the territory and perhaps hoping to be accepted by Dad. The last day that we saw Dad on cam was July 24. After that, eagle activity in the area dwindled to nothing, as it usually does in the late summer. Last year, Mom Hornby was seen on the nest on October 23; Dad was around for several days prior to that. We are all waiting to see what happens this October. Stay tuned ... and check the Forum for daily information. After a relatively uneventful January and February, March 2015 turned out to be a time of great change for Mom and Dad. On the evening of March 1, Mom flew off to chase another eagle. She did not return for her usual brief late-night nest visit. When we next saw Mom, her face, eyes, beak, and the back of her head had several discolored areas that eventually resolved into areas of injury (rather than clinging food from foraging). Mom and Dad were seen together on the cam through March 15 and by our ground observer on March 14. A great number of eagles were in the territory at that time, awaiting herring. Eagles of all ages competed for fish and for good perches. This year, there seemed to be more food competition than usual. There were also a number of new adults, some of whom were vying for Dad's attention. While it appears that many visitors in for the herring spawn may have dispersed, we continue to see some immatures and some young females. At this time (April 2, 2015), we appear to have two or more females (five and six years of age) competing for Dad's attention. We do not know whether Mom has died, has been vanquished, or has removed herself from the fray. There have been no reports of dead or injured/grounded eagles on the island to date. Dad continues to hold and defend the territory. The months of November and December 2014 were relatively uneventful for Mom and Dad. Weatherwise, there were a few strong storms with high winds and rain, which they (and the nest) weathered sucessfully. The days were short and we had a few issues with the cam system, so some days the cam observations were not as extensive as usual. The Ground Observations topic in the Forum holds some interesting information and wonderful photos for the past couple of months. Other eagles (as well as a Perigrine Falcon) have been in the area, sometimes eliciting loud calls from both eagles, plus the occasional chase. However, sometimes the visitor has perched on the same tree as Mom and Dad or in a nearby tree. We have seen both Mom and Dad visiting the nest - Dad brought food to the nest for Mom on December 16 and we believe there was a mating off-nest on December 19. However, there has not been any nest repair activity as would be common for the Fall months. What will 2015 bring for the eagles? Mom and Dad returned from their salmon-feasting to the tree that has now held an eagle's nest for 25 years (1989-2014). Although several eagles were seen throughout the month in their territory, we could not confirm absolutely that any of them were Mom and Dad until October 22. Before that, one notable visitor - perhaps a five-year-old, based on the feather colorations - spent four hours sitting in the nest while a second eagle sat on a branch of the Babysitting Tree. Could that nest visitor have been Hope, who was hatched in this nest in 2009? Check the photos posted in the forum topic and see what you think: Ground Observations 2014. As seen in this 9-minute video, Mom and Dad visited the nest together on October 24. Dad is there first, Mom arrives around five minutes into the video. After a season of ups-and-downs, Mom and Dad fledged one gorgeous eagle, whom we called "Scootch" for Dad Hornby's stylish manner of settling in the nest with a kick of his feet and a wiggle to ensure a perfect nest bowl. Here is a video compilation of the season's important moments, including Scootch's fledging on August 8 at 90 days of age, her/his fall and subsequent homecoming two days later and departure with Mom for the salmon runs. May 2014. One of the two eggs hatched on May 9; we think this is the second egg that was laid, since the first one would have been 40 days old at that time. We can already see the hatchling bouncing up to get food. Eggs were laid March 30 and April 3, 2014. November 2013 - April 2014. The past winter months were fortunately somewhat uneventful for Mom and Dad. Although they had a few visits from young eagles and an adult or two there were no serious challenges as there had been in early 2013. October 2013. The camera was taken down on September 21 and has been "drying out" for the past week and a half. The weather over the next few days was wet and stormy, so the second part of the operation was delayed by several days. On Thursday, October 3, the Securco technician will be on Hornby to examine and clean the camera, and then Dan and crew will replace the camera in the tree. Just in time for Mom and Dad's expected return! HEGPS is very grateful to everyone who contributed to our recent fundraiser ~ thank you to each and every one of you for helping us meet and exceed our goal! September 2013. We noticed that the cam had an unusual amount of condensation on the inside of the dome. The technical experts at Securco, the company that installed the camera system, think that this is due to the unusually rainy and humid weather on Hornby Island over the past few weeks. They recommend taking the camera down from the tree, removing the dome and allowing the camera to dry overnight. The next day the Securco technician will inspect, clean, and make any necessary repairs such as replacing the gasket, then reseal the dome before the cam is replaced in the tree. It will be expensive to have Whiskey Jack Tree Services do two 3-man climbs and the Securco tech travel to Hornby, but there is no doubt that we want to keep observing Mom and Dad in their nest and territory so will pay for these necessary services. Initial estimates suggest a cost of $5000, so we are asking for some help from Mom & Dad's friends to cover current and future expenses. August 2013. After a relatively uneventful summer, marked mostly by crows harassing Mom and Dad on their perches, the eagles have taken off for their typical late summer trip to find salmon. Dad was last seen on Sunday, August 4. Mom spent the next day sitting very quietly in the Babysitting Tree, then took off early on Tuesday (August 6). April 2013. Early in the month, the eagles continued typical pre-nesting behavior, with both bringing in grasses and sticks to the nest, and Dad bringing food gifts to Mom. Once again, an intruder landed on the nest and was chased away by the owners. March 2013. The herring spawn, an annual event in March off Hornby, began on March 5. At first light, we could see patches of pale turquoise water, and by later in the morning such patches were visible from Sandstone to Grassy Point. The spawn attracted several visiting eagles of all ages. Dad continued to reject the "advances" of another female; he brought food gifts to Mom and they mated several times. The usual time frame for Mom Hornby to lay her eggs (~March 20) came and went, however, and Mom did not lay any eggs. February 2013. This was a challenging month for the Hornbys. There were several young visitors to the area, some of whom were allowed to sit on Mom and Dad's perch trees and others that were chased off. More alarmingly, there were a series of confrontations with adults (or subadults), both in the air and on perch trees. One adult intruder landed on the nest tree and in the nest itself with Dad (Feb 8-11). Dad was not pleased and reacted by beaking or wing-slapping this eagle, who seemed to be begging for food gifts from him. At one point, though, she appeared to push him from the nest (Feb 10). Mom Hornby was not seen for four days (Feb 8-11), the same days that this apparently female intruder was close to and in the nest with Dad. Feb 11 was a day of eagles displacing each other from the perch trees, and on Feb 12 we saw Mom and Dad mating on the Babysitting Tree. Since then, Mom and Dad have been together and have been observed mating on several different perch trees. January 2013. More nest materials (sticks and grass) were brought to the nest. December 2012. The first mating to be observed on camera was on December 2, and another mating was seen on December 8. A juvenile was observed sitting in Foster's Fir on Dec 18. October 2012. After a few false alarms, thinking Mom was back when she was not, sightings of both Mom and Dad were confirmed on October 15. Over the next few days, they toured their territory, visiting their various perch trees (Foster's, Babysitting Tree, the Peters' Tree, His&Hers Tree, Mishi's Tree, and the nest) and communicating with a neighboring pair (Mom and Dad Wiigs). The first delivery of nest materials was on October 23. September 2012. 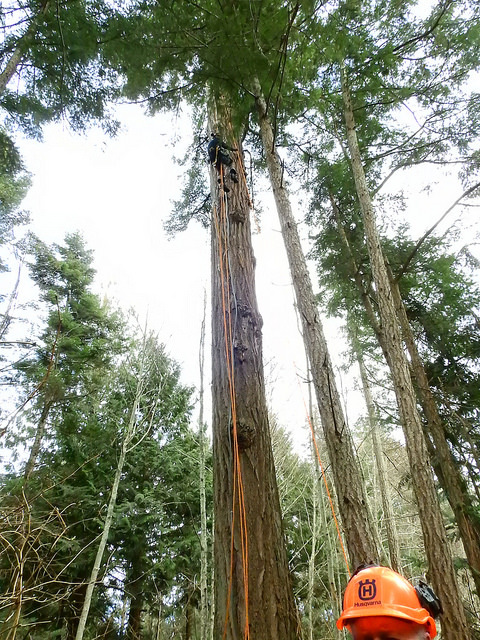 The cam was remounted on the tree about 25 feet higher than the original location. The great view we had is even better now. Dan and crew from Whiskey Jack Tree Services did an amazing job of readjusting the camera - while working nearly 200 feet in the air!